Sticky: Keep app from popping up. What are my options in replacing a broken dongle? Multiple lines with Magic Jack? Softphone or ATA adapter/land line: Which is better quality? Can an old Magicjack+ be used as a USB to Ethernet Adapter? MagicApp on iPhone 3gs ? 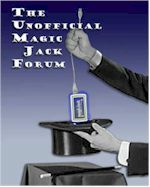 I wonder as Spoofcard working with magic jack ? MagicJack SIP Trunk - is it possible anymore? Anybody have a copy of TjInit1200.exe? Need help with RECEIVING Faxes - sending is just fine! Has anyone used rebuild_mj sucessfully? Downgrade Magicjack for windows 8.1?